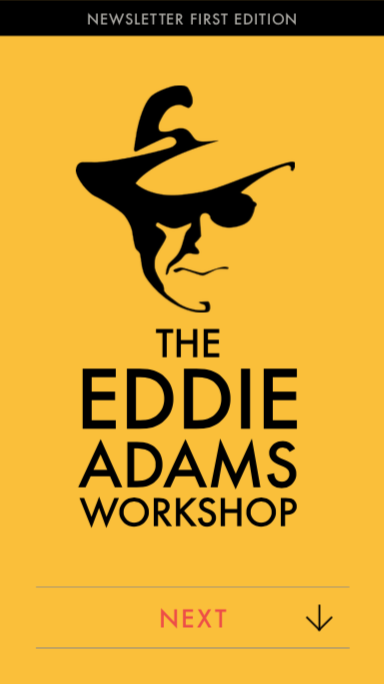 To all participants of the Eddie Adams Workshop: the newsletter/schedule can be downloaded for use on your smart phone (preferred), tablet or computer. 1. Open this webpage on the device you plan to use the newsletter. 2. Open the newsletter PDF located HERE. 3. Download the PDF (download option, upper right). 3. Open the file within any PDF viewer. 4. Check page 2 of the newsletter for optimal view settings. When you open the newsletter for the first time, this is the opening splash screen. To navigate back to the main menu from any page, tap the icon in the upper left corner.